We are pleased to announce that a new digital collection from the Raoul Lufbery Collection (MS-502) is now freely available online, anytime, through the Wright State University Campus Online Repository, at CORE Scholar: Raoul Lufbery Collection. The digital collection includes selected photographs and newspaper clippings pertaining to Lufbery’s World War I service. For the full contents of the original collection, see the collection finding aid. Born Gervais Raoul Lufbery on March 14, 1885, in Chamalières, Puy-de-Dôme, France, Lufbery immigrated to the United States about 1904. He became an American citizen and served briefly in the U.S. Army. 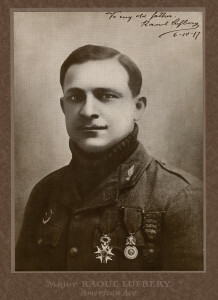 Lufbery would joined the Foreign Legion as a mechanic at the beginning of World War I, later receiving his pilot wings in 1914. In May 1916, Lufbery was assigned to the recently-formed Escadrille Americaine. He was later reassigned to the United States Air Service, after American entry into WWI in 1917. Lufbery was a very successful ace pilot, shooting down at least 17 German planes. Unfortunately, this success and glory was short-lived. On May 19, 1918, with enemy planes coming closer to the airfield for the 94th Pursuit Squadron, Lufbery rushed into the air without performing his usual pre-flight check. Soon his plane took a direct hit from the enemy. In order to escape the burning plane, Lufbery jumped out and was impaled on a fence post, dying instantly. Lufbery received full military honors at his funeral and is interred at the Lafayette Memorial du Parc de Garches, the shrine honoring the Escadrille Lafayette, just outside Paris, France. This entry was posted in Aviation and tagged aviation, aviation history, CORE Scholar, digital collections, MS-502, news, World War I, WWI. Bookmark the permalink.